Objectives To evaluate whether off-patent prescription drugs at risk of sudden price increases or shortages in the United States are available from independent manufacturers approved in other well regulated settings around the world. Setting Off-patent drugs in the USA and approved by the Food and Drug Administration, up to 10 April 2017. Study cohort Novel tablet or capsule prescription drugs approved by the FDA since 1939 that were no longer protected by patents or other market exclusivity and had up to three generic versions. Main outcome measures Number of additional manufacturers that had obtained approval from any of seven non-US regulators with similar standards (European Medicines Agency (European Union), HealthCanada (Canada), Therapeutic Goods Association (Australia), Medsafe (New Zealand), Swissmedic (Switzerland), Medicines Control Council (South Africa), and the Israel Health Ministry). Association with drug characteristics including US orphan drug designation for drugs treating rare diseases, World Health Organization essential medicine designation, treatment area, drug product complexity (that is, with attributes that could complicate establishing bioequivalence or manufacturing), and total Medicaid spending in 2015. Results Of 170 eligible study drugs, more than half (109, 64%) had at least one manufacturer approved by a non-US regulator and 32 (19%) had four or more. Among 44 (26%) drugs with no FDA approved generic versions, 21 (48%) were available from at least one manufacturer approved by one of the seven non-US regulators, and two (5%) by four or more manufacturers. Across all drugs and regulators (including the FDA), 66 (39%) drugs were available from four or more total manufacturers. Of 109 drugs with at least one non-US regulator approved manufacturer, 12 (11%) were approved for patients with rare diseases and 29 (27%) were WHO designated essential medicines; only 12 (11%) were complex products that might be more complicated to import. The highest numbers of drugs were indicated for treating cardiovascular diseases, diabetes, or hyperlipidemia (19, 17%); psychiatric disease (16, 15%); and infectious diseases (15, 14%). In 2015, Medicaid alone spent nearly US$700m (£508m; €570m) on generic drugs without adequate US competition that could have had a manufacturer approved by non-US peer regulatory agencies. Conclusion In this study, more than half the off-patent drugs with no generic competition in the USA had at least one independent manufacturer approved by a non-US peer regulatory agency; slightly fewer than half had four or more total manufacturers. Facilitating US patient access to such manufacturers could help sustain affordable access to essential off-patent drugs. One strategy to counteract these shortages and price increases would be to rapidly increase the number of competitors by expediting Food and Drug Administration (FDA) approval for US marketing of manufacturers of the same drugs already approved by peer drug regulatory bodies, such as the European Medicines Agency (EMA) and Health Canada. It is likely to be faster and more efficient for current manufacturers of an already approved drug to expand production to serve the US market than for a manufacturer to newly enter the market by obtaining FDA approval and building new manufacturing capabilities. Such a system would also allow patients in the USA to access drugs manufactured by previously non-FDA approved companies that may have otherwise been deterred by the cost of an additional approval from the FDA. Thus, the possibility of international competition for US generic drugs would reduce the risk and duration of shortages, and diminish the ability of manufacturers to impose large price increases of generic drugs with limited US competition. One way that the FDA could expedite the importation of generic drug treatments already approved abroad is through a variation of reciprocal approval.272829 For example, the FDA could still issue its own approval of each drug (as required under US law), but it would be issuing that approval on the basis of evidence of the drug’s previous approval by another stringent national regulatory authority. FDA could limit the use of this reciprocal drug approval process to countries with stringent national regulatory authorities and strong safety records, and which the FDA has assessed as having equivalent generic drug approval processes. The few areas in which there remain significant differences among comparable regulators, such as approval of generic narrow therapeutic index drugs, could be excluded from the reciprocal process. The reciprocal approval could also be made contingent on the manufacturers starting the process for standard FDA approval. This approach is consistent with US law and practice.3031 The 2012 FDA Safety and Innovation Act gave the FDA authority to enter into agreements to recognize drug inspections conducted by foreign regulatory authorities if the FDA determined that those authorities are capable of conducting inspections that meet US requirements.32 Pursuant to that authority, the FDA and EMA concluded an agreement on mutual recognition of inspection reports, which was added as an amendment to the existing 1998 US-EU Mutual Recognition Agreement.33 Limiting the use of reciprocal approval to generic versions of drugs already approved and long used in the USA minimizes the safety risks that might otherwise arise from relying on the approval of a novel medication by another regulatory authority. To justify the resources required to establish and maintain a reciprocal approval pathway, it must be useful. This pathway would work only if there are sufficient numbers of generic manufacturers approved to supply drugs outside the USA and that could be called on to export their products. Thus, we assessed manufacturer approvals from non-US peer regulators of drugs approved by the FDA since 1939 that are no longer protected by patents, but lack adequate generic competition. We also examined specific drug characteristics that describe the potential importance of reciprocal drug approval. We used the Drugs@FDA database to identify novel drugs in tablet or capsule form approved by the FDA since 1939, the first full year after the agency began requiring safety information for drug approval. We excluded tentative approvals, biological treatments, over-the-counter drugs, and duplicate listings. If there were multiple currently marketed dosage strengths of a novel drug, we randomly selected one dosage strength for inclusion. If a novel drug was discontinued but had at least one active generic version available, it was included in the sample. We excluded discontinued novel drugs for which there were also no active generic versions, because we assumed that the drug was no longer used. We excluded drugs with current patent protections or other market exclusivity, identified from the Orange Book in April 2017. We focused on drugs in tablet or capsule formulation partly because injections and infused drugs are predominantly purchased by hospitals and physician facilities. Finally, we excluded one drug because it had only one approved generic version that was protected from generic competitors by 180 day exclusivity at the time of data extraction. For each drug in our final cohort, we used Drugs@FDA to identify FDA approved bioequivalent generic drugs by matching active ingredient and formulation. We excluded discontinued generic drugs, tentative approvals, and duplicate applications filed by the same generic manufacturer. We disregarded multiple dosage strengths and only counted the generic drug once. Firstly, we determined whether each FDA approved drug was designated under the US Orphan Drug Act of 1983, for the indication for which it was initially FDA approved. The Orphan Drug Act status signifies a drug indicated for a rare disease affecting fewer than 200 000 people in the USA.35 Secondly, we identified whether each drug in our sample was included in the most recent World Health Organization’s Model List of Essential Medicines,36 which includes drugs considered fundamental for any healthcare system. One drug, ferric hexacyanoferrate (Prussian blue), was included in the WHO list as a powder but approved by the FDA as a capsule. Thirdly, using WHO’s Anatomic Therapeutic Classification system,37 we categorized all drugs in the sample into one of nine treatment classes: autoimmune or musculoskeletal; cancer; cardiovascular, diabetes, or hyperlipidemia; gastrointestinal; genitourinary; infectious disease; neurology; psychiatry; and other. If a drug was listed in more than one treatment class, we selected the class within which the drug was initially approved by the FDA. We also determined the complexity of drugs lacking in US generic competition. A drug is considered a complex product if specific attributes make it difficult to manufacture the drug or establish bioequivalence, such as complex active ingredients (eg, peptides, complex mixtures, naturally sourced) or complex formulations (eg, colloids or liposomes).38 One author (RG) reviewed the chemical structure of each novel drug in our cohort to determine whether it was a complex product. In addition, a list of pharmaceutical related citizen petitions39 and https://www.regulations.gov were used to identify any citizen petitions that were filed for issues of bioequivalence or generic interchangeability. These drugs were also considered complex. Drugs with unclear status were independently classified by a second author (ASK) and disagreements resolved through consensus (n=2). Finally, we used the Medicaid state drug use database to determine spending by that program in 2015 for each drug in our sample. These data provide insights into US spending on generic drugs without adequate competition and the drugs’ market sizes. We focused on Medicaid spending because the data source separates spending by different formulations of each drug, while data sources for Medicare Part D spending do not. Medicaid is a federal and state funded health insurance program for people on low incomes that represents about 20% of US prescription drug spending and serves 70 million patients.4041 This data source includes every US state’s data for outpatient drugs covered under the Medicaid Drug Rebate Program, but does not incorporate rebates. For each drug, we matched the National Drug Code (NDC) number with the generic drug name, and totaled spending across all FDA approved brand name and generic versions of the identified formulation. For all drugs in our sample, we obtained data from seven non-US peer drug regulatory agencies: EMA (European Union), HealthCanada (Canada), Therapeutic Goods Association (Australia), Medsafe (New Zealand), Swissmedic (Switzerland), Medicines Control Council (South Africa), and the Israel Health Ministry. These regulatory bodies were selected because they were included in a list of high quality regulatory authorities in a recent US bill that proposed to create a system of international drug reciprocity,42 and their publicly accessible databases offered information in English. Two authors (RG and MC) independently cataloged manufacturers with approval from each of these seven regulators. Manufacturers were counted if their drug shared its active ingredient and formulation with the FDA approved drug. Through searches of company websites and other internet sources, the reviewers identified the manufacturers approved by each regulatory body that were different from the FDA approved manufacturers, accounting for mergers, acquisitions, and transfers of drug licenses between manufacturers. If the manufacturers were the same as those approved in the USA, they were excluded. Disagreements were resolved through consensus (n=3). For each drug, we determined the number of manufacturers that were approved by the seven non-US drug regulators but not approved by the FDA. We also identified for each drug the total number of manufacturers approved across all regulators, including the FDA and seven non-US regulators. We converted these results into ordinal variables (0, 1, 2, 3, and ≥4 manufacturers). We then determined the proportion of drugs with at least one manufacturer and those with four or more manufacturers, because a previous study determined that four manufacturers ensured sufficient competition to prevent substantial price increases.12 We did this assessment for the seven non-US regulators and for all eight regulators, including the FDA. We used χ2 tests to compare the likelihood of having at least one non-US regulator approved manufacturer based on four novel drug characteristics: US orphan status designation, WHO essential medicine designation, treatment class, and complexity. We used the Wilcoxon-Mann-Whitney test to compare the difference in 2015 Medicaid spending between drugs with and without at least one non-US regulator approved manufacturer of FDA approved generic drugs. Among these same five characteristics, we repeated the analyses to compare the likelihood of having four or more different manufacturers across all regulators, including the FDA and non-US regulators. We used Microsoft Excel 2016 (Microsoft Corp) and Stata 12.0 (StatCorp) to conduct all analyses. No patients were involved in setting the research question or the outcome measures; nor were they involved in the design and implementation of the study. We have no plans to involve patients in dissemination. We found 170 novel drugs in tablet or capsule formulation approved by the FDA since 1939 that were off-patent and had up to three FDA approved generic versions, as of 10 April 2017 (fig 1). Three quarters of drugs in our cohort (126, 74%) had at least one FDA approved generic version (table 1). Seventy (41%) were approved after 1983, of which 23 (33%) were designated as having orphan status. About one fifth (38, 22%) were considered essential medicines by WHO. Drugs indicated for the treatment of cardiovascular disease, diabetes, or hyperlipidemia were most common (33, 19%), followed by those for infectious disease (22, 13%) and psychiatric disease (22, 13%). A small number of drugs (22, 13%) were complex products. Among the 151 drugs covered by Medicaid, the median 2015 Medicaid spending was US$1m (interquartile range 0.2m-4.3m; table 1); total spending was $1bn, which accounted for about 2% of total Medicaid spending in 2015 ($57bn). More than half the drugs (109, 64%) had at least one manufacturer with a version approved by a non-US drug regulator, while about a fifth (32, 19%) had four or more manufacturers. 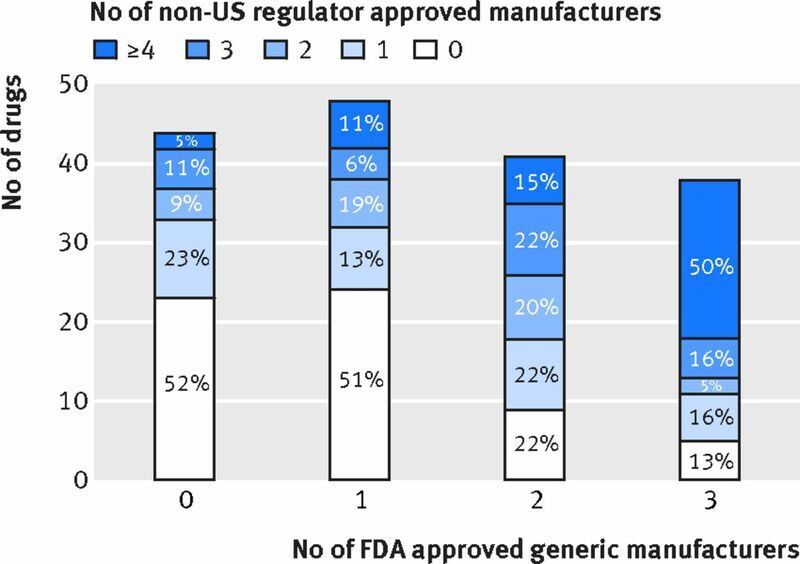 Of 44 (26%) drugs in our sample with no generic versions approved by the FDA, 21 (48%) had at least one manufacturer with a version approved by a non-US drug regulator (fig 2), and 19 (43%) drugs were produced by one to three non-US manufacturers. For example, albendazole, a broad spectrum antiparasitic drug, had no generic versions approved by the FDA but three versions approved by non-US drug regulators. Nitisinone, which treats hereditary tyrosinemia type 1, and nabilone, which treats chemotherapy induced nausea and vomiting, were the only drugs with no generic versions approved by the FDA and four or more versions approved by non-US regulators. Of 170 drugs with up to three FDA approved generic versions, 147 (86%) had at least one approved manufacturer across both FDA and non-US regulators. Furthermore, 66 (39%) could reach the threshold of four or more approved manufacturers if the FDA permitted reciprocal approval of drugs approved by any of the seven non-US regulators. For instance, cefixime, a commonly used antibiotic, had one FDA approved generic version but a total of four versions when including those approved by non-US regulators. Similarly, diltiazem, a calcium channel blocker used to treat cardiovascular conditions such as angina and hypertension, had two FDA approved generic versions but 10 approved versions across all regulators. Among drugs with up to three generic versions approved by the FDA, the number of manufacturers approved by non-US regulators did not vary significantly by drug characteristics (table 2). However, of the 109 drugs with at least one manufacturer approved by a non-US regulator, 12 (11%) were approved under the 1983 Orphan Drug Act for patients with rare diseases and 29 (27%) were WHO designated essential medicines, suggesting that reciprocal drug approval could be useful for some vulnerable populations. The highest numbers of drugs were indicated for the treatment of cardiovascular diseases, diabetes, or hyperlipidemia (19, 17%); psychiatric disease (16, 15%); and infectious diseases (15, 14%). Only 12 (11%) were complex products, which may need product specific testing. The total 2015 Medicaid spending for the 109 drugs with at least one manufacturer approved by a non-US regulator manufacturer was nearly US$700m. Of the 66 drugs with four or more manufacturers across all eight regulators, including the FDA and non-US regulators, eight (12%) were designated to have orphan status and treat rare diseases and 18 (27%) were WHO designated essential medicines (table 2). The greatest numbers of drugs were indicated for the treatment of cardiovascular diseases, diabetes, or hyperlipidemia (14, 21%); psychiatric disease (10, 15%); and neurological disease (10, 15%). Only six (9%) drugs were complex products. Total spending in 2015 by Medicaid for the 66 drugs with four or more manufacturers was just over US$400m. International sources could improve the supply and increase the competition for off-patent drugs in the USA with insufficient competition, about two thirds of which had at least one additional manufacturer with a version approved by a non-US regulator. Including the seven non-US peer regulators, nearly 40% of the drugs in our analysis could be served by four or more manufacturers, helping ensure low prices and avoid unexpected shortages.2643 Most of those drugs treat infectious diseases; neurological and psychiatric diseases; or cardiovascular diseases, diabetes, or hyperlipidemia—some of the most prevalent and preventable medical conditions affecting US patients. In addition, many of the drugs in our sample were WHO designated essential medicines or intended for patients with rare diseases. Several legislative attempts have been made to allow drug imports into the USA, particularly from Canada.4445 For example, the Maine Pharmacy Act was passed in 2013 to allow direct importation of prescription drugs for personal use from pharmacies in Canada, the United Kingdom, New Zealand, and Australia, but was later ruled unconstitutional under the premise that importation is a federal issue. The 2003 Medicare Modernization Act allowed for drug importation with the certification of the Secretary of Health and Human Services, but it has never been implemented. More recently, Senators Bernie Sanders (Independent, Vermont) and Amy Klobuchar (Democrat, Minnesota) proposed allowing importation from Canada, but it was voted down. Drug industry advocates and even previous FDA commissioners have argued that importing prescription drugs that were approved outside the US could compromise, or at least raise concerns for, patient safety.4647 Some safety concerns include difficulty tracking imported drugs to their origin, particularly in cases of counterfeit drugs that cause harm to patients, and insufficient resources for screening and verifying drug authenticity.46 The safety of the US prescription drug supply is of paramount importance. In addition to safety concerns, critics of importation have taken issue with the quality of non-FDA approved products, particularly in the context of so-called complex products that could require additional testing to demonstrate bioequivalence.48 Among FDA approved drugs with few generic competitors, only 22 drugs (13%) were complex products, of which only 12 had at least one manufacturer with approval from a non-US regulator. If US legislators designed a system to facilitate reciprocal generic drug approval, it could initially exclude this small number of complex drugs to build trust while studying the interchangeability of complex products approved outside the US to determine whether the system could eventually be extended to this class of products. Although we reviewed all FDA approvals since 1939, our results could be conservative because we only included novel drugs approved in tablet or capsule formulation, and did not account for other treatments such as reformulated drugs and combination therapies. In addition, when we categorized non-US regulators’ approvals, we maintained consistency by only considering drugs approved in the same formulation. Our results could also be conservative because our analysis used data on regulatory drug approvals, which does not necessarily indicate that the generic drug was marketed. Thus, there might be many more off-patent products that would qualify for reciprocal approval because some US generic manufacturers have decided to stop manufacturing the product without formally withdrawing their regulatory approval. Conversely, some of the manufacturers approved in non-US markets may have never launched or may have stopped selling the product in those settings. Furthermore, our analysis describes only the number of potential additional non-US manufacturers, without accounting for any effect on international supply; that is, some non-US approved generic manufacturers might not be able to supply the US market because of limited production capacities. Finally, our estimates for prescription drug spending could be conservative given that we focused only on Medicaid spending, although the government program covers nearly one quarter of the US population.50 Further studies might offer comparative analyses of Medicaid spending on drugs with limited US generic competition versus overall Medicaid spending on all generic drugs. More than half the off-patent drugs approved by the FDA since 1939 with limited generic competition in the USA had at least one additional non-US manufacturer. Importation would help slightly less than half reach a threshold number of generic competitors sufficient to address periods of drug shortages and substantial price increases. Reciprocal approval of prescription drugs in the USA from international sources could help with rising prices and shortages of off-patent drugs, but only along with other strategies dealing with the domestic causes of generic drug market failures. Contributors: RG, TJB, and ASK were responsible for the conception and design of this work, and drafted the manuscript and conducted the statistical analysis. RG, MC, and ASK were responsible for acquisition of data. ASK provided supervision. All authors participated in the analysis and interpretation of the data and critically revised the manuscript for important intellectual content. RG and ASK had full access to all the data in the study and take responsibility for the integrity of the data and the accuracy of the data analysis, and are the study guarantors. Funding: Study funded by the Laura and John Arnold Foundation, with additional support from the Engelberg Foundation, Harvard Program in Therapeutic Science, and Yale University-Mayo Clinic Center of Excellence in Regulatory Science and Innovation. The funders were independent from the research development or conduct. Competing interests: All authors have completed the ICMJE uniform disclosure form at www.icmje.org/coi_disclosure.pdf and declare: support from the Laura and John Arnold Foundation, Engelberg Foundation, Harvard Program in Therapeutic Science, and Yale University-Mayo Clinic Center of Excellence in Regulatory Science and Innovation; in 2017, TJB and ASK received honorariums from the Brookings Institution for taking part in a conference on drug pricing at the Hutchins Center in which they presented their paper “Can drug importation address high generic drug prices”; ASK has received grants from the FDA Office of Generic Drugs and Division of Health Communication (2013-16); JSR receives support through Yale University from the Food and Drug Administration as part of the Centers for Excellence in Regulatory Science and Innovation program, from Medtronic, and the Food and Drug Administration to develop methods for postmarket surveillance of medical devices, from Johnson and Johnson to develop methods of clinical trial data sharing, from the Centers for Medicare and Medicaid Services to develop and maintain performance measures that are used for public reporting, from the Blue Cross Blue Shield Association to better understand medical technology evaluation, and from the Laura and John Arnold Foundation to support the Collaboration on Research Integrity and Transparency at Yale; no other relationships or activities that could appear to have influenced the submitted work. Data sharing: Data files are available from the authors on reasonable request. Transparency: The lead authors (the manuscript’s guarantors) affirm that the manuscript is an honest, accurate, and transparent account of the study being reported; that no important aspects of the study have been omitted; and that any discrepancies from the study as planned have been explained. US Government Accountability Office. Drug shortages: public health threat continues, despite efforts to help ensure product availability. 2014. https://www.gao.gov/assets/670/660785.pdf. Generic Pharmaceutical Association. Generic drugs continue to deliver billions in savings to the US healthcare system, new report finds. 2016. https://www.prnewswire.com/news-releases/generic-drugs-continue-to-deliver-billions-in-savings-to-the-us-healthcare-system-new-report-finds-300347698.html. Generic Pharmaceutical Association. Generic drug savings in the US. 2015. www.gphaonline.org/media/wysiwyg/PDF/GPhA_Savings_Report_2015.pdf. American Society of Health-System Pharmacists. Drug shortages. 2017. https://www.ashp.org/Drug-Shortages/. Sagonowsky E. The top 15 generic drugmakers by 2016 revenue: FiercePharma. 2017. https://www.fiercepharma.com/special-report/top-15-generic-drugmakers-2016/. Woodcock J. Statement to the House, Committee on Oversight and Government Reform. Implementation of the generic drug user fee amendments of 2012 (GDUFA). 2016. https://www.fda.gov/NewsEvents/Testimony/ucm485057.htm. Pollack A. Drug goes from $13.50 a tablet to $750, overnight: The New York Times. 2015. https://www.nytimes.com/2015/09/21/business/a-huge-overnight-increase-in-a-drugs-price-raises-protests.html?_r=0%2F. US Government Accountability Office. Generic drugs under Medicare: Part D generic drug prices declined overall but some had extraordinary price increases. 2016. https://www.gao.gov/assets/680/679022.pdf. International Trade Administration, US Department of Commerce. Top markets report: pharmaceuticals. 2016. https://trade.gov/topmarkets/pdf/Pharmaceuticals_Executive_Summary.pdf. US Government Accountability Office. Drug safety: FDA has improved its foreign drug inspection program, but needs to assess the effectiveness and staffing of its foreign offices. 2016. https://www.gao.gov/assets/690/681689.pdf. Kaiser Family Foundation. Kaiser health tracking poll: November 2016. http://files.kff.org/attachment/Kaiser-Health-Tracking-Poll-November-2016-Topline. US Food and Drug Administration. Regulatory procedures manual. 2017. https://www.fda.gov/ICECI/ComplianceManuals/RegulatoryProceduresManual/default.htm. US Food and Drug Administration. Temporary importation of Lipodox. 2012. https://www.fda.gov/downloads/Drugs/DrugSafety/DrugShortages/UCM295225.pdf. Howard P, Feyman Y. If a drug is good enough for Europeans, it's good enough for us: Health Affairs Blog. 2014. https://healthaffairs.org/blog/2014/02/14/if-a-drug-is-good-enough-for-europeans-its-good-enough-for-us/. Barua B, Esmail N. The case for mutual recognition of drug approvals: Fraser Institute. 2013. https://www.fraserinstitute.org/sites/default/files/case-for-mutual-recognition-of-drug-approvals.pdf. Bollyky TJ, Kesselheim AS. Can drug importation address high generic drug prices? : Center for Health Policy at Brookings. 2017. https://www.brookings.edu/wp-content/uploads/2017/05/wp29_bollykykesselheim_drugimportation.pdf. Food Drug & Cosmetic Act Chapter V: Drugs and Devices, § 351(505A). 2015. Food Drug & Cosmetic Act Chapter V: Drugs and Devices, § 351(804). 2015. Food Drug & Cosmetic Act Chapter V: Drugs and Devices, § 351(809). 2015. US Food and Drug Administration. FDA takes unprecedented step toward more efficient global pharmaceutical manufacturing inspections. 2017. https://www.fda.gov/NewsEvents/Newsroom/PressAnnouncements/ucm583057.htm. US Food and Drug Administration. Prioritization of the review of original ANDAs, amendments, and supplements. 2017. https://www.fda.gov/downloads/AboutFDA/CentersOffices/OfficeofMedicalProductsandTobacco/CDER/ManualofPoliciesProcedures/UCM407849.pdf. US Food and Drug Administration. Designating an orphan product: drugs and biological products. 2017. https://www.fda.gov/ForIndustry/DevelopingProductsforRareDiseasesConditions/HowtoapplyforOrphanProductDesignation/default.htm. World Health Organization. WHO model list of essential medicines, 19th list (April 2015). 2015. www.who.int/medicines/publications/essentialmedicines/EML_2015_FINAL_amended_NOV2015.pdf?ua=1/. World Health Organization (WHO) Collaborating Centre for Drug Statistics Methodology. WHO ATC/DDD Index 2017. 2016. https://www.whocc.no/atc_ddd_index/. Lionberger R. Developing new bioequivalence approaches for complex products. 2014. www.gphaonline.org/media//cms/Robert_Lionberger_1.pdf. Feldman R, Frondorf E, Cordova AK, Wang C. Database from empirical evidence of drug pricing games - a citizen's pathway gone astray. 2017. https://papers.ssrn.com/sol3/papers.cfm?abstract_id=2924673. Medicaid.gov. State drug utilization data. https://www.medicaid.gov/medicaid/prescription-drugs/state-drug-utilization-data/index.html. Centers for Medicare & Medicaid Services. Medicaid drug spending dashboard. 2016. https://www.cms.gov/Newsroom/MediaReleaseDatabase/Fact-sheets/2016-Fact-sheets-items/2016-11-14-2.html. Senator Cruz T. Reciprocity ensures streamlined use of Lifesaving Treatments Act of 2015. 2015. https://www.congress.gov/bill/114th-congress/senate-bill/2388/text/. US Food and Drug Administration. FDA analysis of retail sales data from IMS Health, IMS National Sales Perspective, 1999-2004. 2005. https://www.fda.gov/aboutfda/centersoffices/officeofmedicalproductsandtobacco/cder/ucm129385.htm#P3_356/. McGinley L. Four former FDA commissioners denounce drug importation, citing dangers to consumers: The Washington Post. 2017. https://www.washingtonpost.com/news/to-your-health/wp/2017/03/17/four-former-fda-commissioners-denounce-drug-importation-citing-dangers-to-consumers/?utm_term=.30df4b82e1d6. Freeh S, and Sullivan LLP. Report on the potential impact of drug importation proposals on US law enforcement. 2017. https://storage.googleapis.com/m1738/20170605_Report on Counterfeit Drugs.pdf. Medicaid.gov. Medicaid and CHIP Enrollment Data Highlights 2017. October 2017. .